Kampai and Gun Bae to Kentucky Bourbon! There’s a reason East Asia loves Kentucky: it’s the top bourbon producer in the world. When East Asia drinks, it very often drinks to Kentucky. Over the past decade, demand for bourbon whiskey has exploded, driven largely by the international market. Not all bourbon comes from Kentucky; the process of making the whiskey can be replicated in other states, and some good recent entries have come from New York. 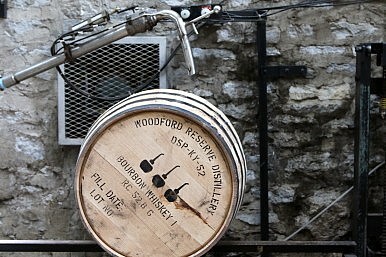 However, Kentucky remains the number one bourbon producer in the world. The 1970s and 1980s were tough for bourbon distillers, as demand for the spirit dropped relative to other whiskeys, and demand for whiskey dropped against other spirits. Japan helped lead the bourbon revival, driving demand in the 1980s. Perhaps because it carries a sense of lineage and tradition, bourbon seems to have an appeal in Japan that exceeds even its appeal in Kentucky. In January 2014, the Japanese firm Suntory acquired Beam, one of the largest producers of bourbon in Kentucky. Suntory expected to expand Beam’s distribution network across Asia, and beyond. Suntory’s expectations were at least partially justified by another year of increasing bourbon revenues, led by exports to East Asia. The 2010 version of the U.S.-South Korean FTA reduced tariffs on bourbon by 20%, allowing Kentucky distillers greater access to the huge South Korean liquor market. Tasting parties in Seoul soon ensued. The unexpected popularity of the spirit has generally been a boon to Kentucky, but has also put a great deal of pressure on producers. Individual bourbons require very specific recipes, with set periods for remaining in barrels. Accordingly, the industry cannot simply ramp up production in response to increasing demand; the most popular bourbons take years to produce, with premium brands often taking even longer. This means that even established distillers have to take substantial risks in estimating what the market will look like in five, ten, or twenty years. But the explosion of interest in bourbon has also substantially improved the product. Greater marketability as given distillers more freedom to experiment, and the ability to attack niche markets with specialized products. Nearly every distillery in Kentucky can boast a variety of different kinds of bourbon, with premium, experimental, and single-barrel versions adding to the diversity of the product. People in the bourbon industry know that things could still turn around. Demand for spirits has a faddish quality, and interest in bourbon has collapsed before. Attacking the Chinese market will be key; bourbon exports to China have increased dramatically over the last decade, but thus far export to China represent only about a tenth of exports to Japan. Moreover, word has it that sales of all premium liquors have dropped in China over the past two years, apparently because of changes in gift-giving culture. And U.S. producers (not to mention Suntory) may also find ceilings on the demand for bourbon in Korea and Japan (although the potentially lucrative North Korean market remains available). But the bourbon giants in both Japan and Kentucky may hope that TPP facilitates the opening of other markets in Southeast Asia, as well as Latin America. This is the second of a five part series on the relationship of the Commonwealth of Kentucky with the Asia-Pacific. The first installment focused on TMMK, the largest Toyota production plant in North America.